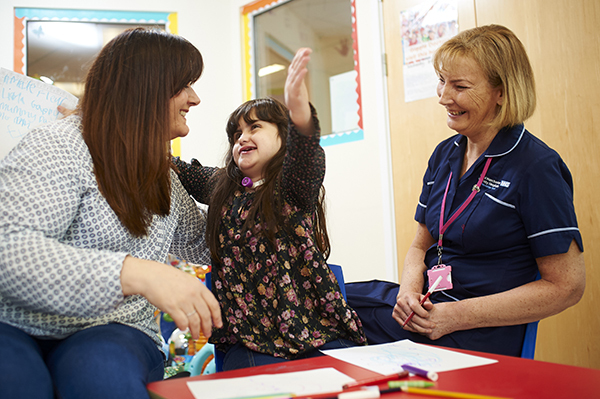 Lesley Chan describes the difference specialist respiratory nurse Joanna O'Toole has made to her daughter Amélie and their whole family. Lesley Chan (left) with Amélie and specialist respiratory nurse Joanna O'Toole. Jo O’Toole was the specialist respiratory nurse for our daughter Amélie, who has CHARGE syndrome, for several years. She gave us truly personalised and kind care. Many times she stayed for hours after her shift finished to sit with us and provide comfort and compassionate care. We were never made to feel rushed. Jo, who worked for Royal Manchester Children’s Hospital, was always positive and kept me positive. She provided some adult company in an often lonely world with frequent admissions. She always included and asked about Amélie's three siblings, but more importantly remembered their stories and journeys – she would ask for updates months later. This shows she truly listened and cared about all our family and not just Amélie. Jo would phone us to provide updates and chased every result. She always found us when we were in A&E and made a plan – and ensured the nursing teams followed it. She arranged all our IVs for home, keeping us together and our girl’s health as good as it could be. Jo made us all laugh – she has a silly dance and wears a smile 24/7. And she made me feel safe, knowing that she knew our girl so well. Amélie is profoundly deaf and partially sighted and relies on facial expression. Jo knew how to raise a giggle and bring her sense of humour out every time. She has now retired after dedicating 38 years to children's nursing and the NHS. I don't know how we will manage without her overseeing Amélie's care. The fact that she says after all that time 'I've truly loved my job' says it all. Jo came to say goodbye as I work at the same trust, and she said she could not go without a hug. I have never seen her without her smile. We have such admiration for our wonderful nurse. She is truly special. As a parent I will feel empty without her in all our lives. What a credit to the NHS Jo has been.